DVD11 is a 2017 Treasure Hunt and 10/10 in the Street Beasts series. 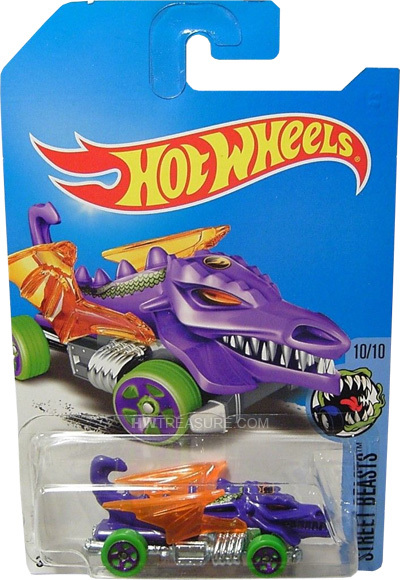 The purple dragon body has green & black scales down the back and a black & orange low production symbol on the head. 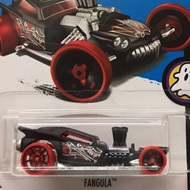 The car has orange eyes, translucent orange wings, green 5-spoke wheels with purple rims, and an unpainted metal Malaysia base. 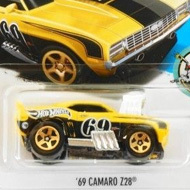 This vehicle can be found in mix “C” of 2017 Hot Wheels mainline cases. Dragon Blaster made its debut in the Color Shifters Creatures series in 2010. It is a unique vehicle that resembles a dragon.